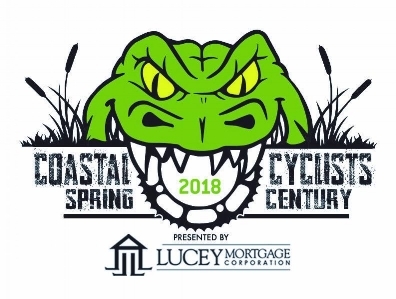 The Coastal Cyclists Spring Century 2018 is this Saturday. You can still register at packet pickup Thursday and Friday afternoon until 6:00 PM at Frothy Beard Brewing. Please pay attention to these companies who are doing their part to build the cycling community in the Lowcountry. They are making an investment in us, so do your best to prove they made a good decision. LUCEY MORTGAGE - If you are buying a house or refinancing, you owe it to yourself to get an interest rate quote from Lorcan and the team at Lucey Mortgage. I first dealt with them many years ago and was impressed with the efficiency, the variety of products they could offer me, and the excellent communication. You cannot get better personal service and the rates are hard to beat. South Carolina Air National Guard - The Swamp Fox - Always First! The 169th Fighter Wing is an opportunity to serve the USA as a part timer. They very enthusiastically contributed to the Spring Century because they see cyclists as a community of good citizens who are fit and committed to service. It is true. Trek Bikes of Mount Pleasant and West Ashley - Ben and Mary Ann of the local Trek stores have probably done more to keep our spring century going the last few years than just about any single entity in town. They will be out there again this year with mechanics and SAG vehicles. Blue Sky Endurance - Blue Sky is a strong force in endurance sports in the Lowcountry, and is a new and ardent supporter of Coastal Cyclists. Matt and Blue Sky will be out in force at the second rest stop to make sure all you riders are hydrated and fed and will provide mechanic support. Majoring in triathlons. Charleston Bicycle Company - For many years The Charleston Bicycle Company was the provider of our club's spring century. Their store in West Ashley has been a stalwart of the road cycling scene for many years. Jeff and his team will provide mechanical support and rest stop volunteers at the first rest stop. Ride Bikes - Greg Jones and his crew provide a level of personal service and bicycle expertise that is hard to find anywhere. No glitz or glamour, but solid bikes, bike advice and service from their store in West Ashley. Look for the Ride Bikes SAG vehicle and the local folk hero, driver and mechanic, Myles. The Bike Shoppe - With two stores, and a rumored third store, The Bike Shoppe covers the Charleston area with options for new bikes, service and bike rentals. Look for mechanical services from The Bike Shoppe at the third rest stop. Hellman Financial, LLC - Scott wanted to enhance the safety of the ride and has contributed bib numbers that will help us identify riders, if there is a problem. They also make really cool souvenirs to pin to your wall. Hellman Financial is your resource for boutique corporate benefits service (aka insurance). Check it out. Lowcountry Racing - Our oldest and favorite local race team will be out in force this Saturday. The team members will provide pacing for both the 100 mile and the 100 kilometer routes. If the distance seems daunting, join one of the pace groups and be assured that you've got competent riders with you who can keep the pace steady and make the miles fly by. There are a lot of LCR members who are also Coastal Cyclists members.